Weird and Wonderful Pets – Extraordinary animals that you can keep at home! Welcome to the Weird and Wonderful Pets website! This project is all about inspiring young minds! My name is Stewart McPherson. I grew up with a miniature zoo of creepy crawlies in my bedroom. I fell in love with nature through keeping and collecting small exotic animals, caring for them on a daily basis, and understanding their fascinating biology, ecology and adaptations. My early obsession with weird and wonderful creatures defined my life long passion for the natural world, and shaped my working life as a natural history writer and wildlife film maker. These days, not enough parents show their children the beauty of spider's web sparkling with dew in the morning light, or explain the miracle of the metamorphosis of a butterfly, or turn over a log to see that intricate world of alien creepy crawlies below our feet. Those magical early encounters with nature imprint on children's minds, and can be the most powerful memories that stay with us for our entire lives. Do you remember seeing a butterfly as a child? Or perhaps birds and flowers in your garden? All children are born in total awe of nature, but that curiosity and interest often gets lost along the journey to adulthood - especially during teenage years. This is especially true nowadays, with more and more people living in cities, disconnected from wildlife and wild areas. But never has the world needed more passionate naturalists, scientists and conservationists than now. 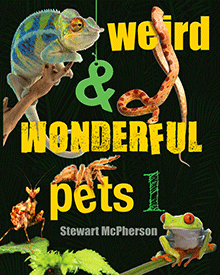 Weird and Wonderful Pets is about nurturing passion in young people as well as adults. This website offers films, downloadable info sheets, text and images as a completely free resource for all to enjoy. My goal is to showcase a range of small exotic creatures that can be kept ethically and legally at home. While animal husbandry must always be taken VERY seriously (see golden rules video), the creatures that I have profiled here all have quite simple culture requirements, and it is easy to provide suitable habitats to meet their needs. If you can (1) buy pets from ethical sources, (2) provide a suitable environment with correct culture conditions, (3) only obtain the quantity of pets that you can properly take care of and (4) ensure that no pets escape into habitats in which they do not belong, then looking after weird and wonderful pets, and showing their life cycles and natural history stories to the next generation is an incredible way to inspire young minds and help nurture budding naturalists, scientists and conservationists. I hope that you enjoy reading about these weird and wonderful pets. Remember they are living creatures, but if you look after them correctly, you will be rewarded by their fascinating behaviour and life cycles processes! Show your weird and wonderful pets to people around you and inspire others with the beauty of the natural world! Show people that invertebrates, amphibians and reptiles are not "gross", but when you look closely, they have an intricate beauty and amazing stories to tell! Help kindle the next generation's passion for nature! Please click on the links on the left to visit different pages about each group of weird and wonderful pets! Each pet type has its own specially made short film that I hope you will enjoy!